This airticle conteens Arabic text, written frae right tae left in a cursive style wi some letters joined. Ithoot proper renderin support, ye micht can see unjoined Arabic letters written left-tae-right insteid o right-tae-left or ither symbols insteid o Arabic script. 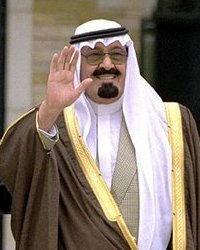 Keeng Abdullah Bin Abdulaziz Bin Abdulrahman Bin Faisal Bin Turki Bin Abdullah Bin Muhammad Bin Saud, Custodian o the Twa Holy Mosques, (Arabic: خادم الحرمين الشريفين الملك عبد الله بن عبد العزيز آلسعود‎, born 1 August 1924-dee'd 23 Januar 2015) wis the saxt Keeng o Saudi Arabie, an heid o the Hoose o Saud frae 2005 till his daith. He succeedit tae the throne an assumed the title o Keeng upon the daith o his hauf-brither, Keeng Fahd, on August 1, 2005. As Crown Prince syne 1982, he haed previously actit as de facto regent an thus ruler o Saudi Arabie syne Januar 1, 1996, when keeng Fahd wis incapacitatit bi a major stroke. He wis formally enthroned on August 3, 2005. Ane o his sons, Prince Mutaib, serves as a deputy commander in the Saudi Naitional Guard. ↑ King Fahd of Saudi Arabia dies, BBC News, August 1, 2005. Accessed March 29, 2008. ↑ "King Fahd ibn Abdel-Aziz Al Saud: The Times obituary", Times Online, August 1, 2005. Accessed March 29, 2008. Wikimedia Commons haes media relatit tae Abdullah of Saudi Arabia. This page wis last eeditit on 18 Mairch 2017, at 17:34.